Joy Rollston,group vice-chairperson and host of the charity 'can't cook,won't cook ' event. Plans are already underway for the Armagh NW groups special fundraising event, ‘Can’t Cook, Won’t Cook’ in aid of the NI Air Ambulance as part of the Ulster Farmers’ Union Centenary project to raise a combined £100,000 for the chosen charity through various activities during 2018. The event will be hosted by the group’s vice-chairperson Mrs Joy Rollston who has already successfully hosted a number of these events in the Armagh area and Joy is hopeful that the group target of £2000 will be reached. Members of the group with Eddie Boyd and Kenny Linton outside Dunbia on a recent walk the line visit. Tickets for the event,which will be held in Kildarton Parish Hall on the Hamiltonsbawn Road on Thursday, 8th March 2018 at 7.30pm are available from the Group Office, 1aa Dobbin Street and are priced at £10 which includes a light supper and refreshments. Group Chairman, Mr Alexander Nicholl would value of the support of the local community for the charity appeal which he states will be a very entertaining evening. Mr Wesley Aston, UFU Chief Excecutive has already volunteered to be one off the four contestants helping Joy prepare the dishes on the night. In October some of the members had the opportunity of visiting the Dunbia factory and retailing facilities in Dungannon which was organised and promoted by the LMC as ‘Walk the Line’ to give the primary producer first hand experience of seeing their produce processed and packaged ready for retail distribution. 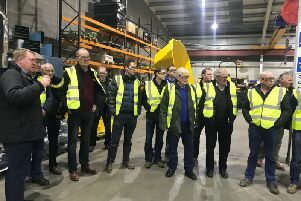 All those who were able to attend the morning which was hosted by Mr Eddie Boyd and Mr Kenny Linton thoroughly enjoyed the experience and found the information provided by the hosts very educational especially around good animal husbandry techniques which can enhance the carcase presentation. The group managers are planning to hold a silage competition in early January with entries invited from beef and sheep and dairy members. Please contact the office for more details.